AUGUSTA, Ga. – The story was that Brooks Koepka had lost too much weight, dropping 20 pounds off his bulky (for a golfer) frame. He did it, perhaps, so he’d look good in an ESPN the Magazine photo spread. As such, he could no longer hit the ball as far, potentially derailing a game that had captured three of the past seven major championships. “For him to change his body, and his body chemistry, for vanity reasons, for a vanity shoot, is the most reckless self-sabotage that I have ever seen of an athlete in his prime,” the Golf Channel’s Brandel Chamblee unloaded on the air. Hyperbole was clearly in fashion. Details remained scarce. Koepka had dieted his way out of greatness? Really? 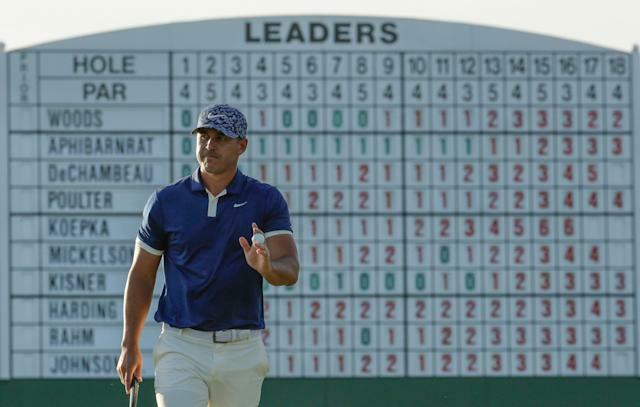 Thursday night Koepka sat inside the Augusta National interview room, sitting atop the first-day leaderboard (tied with Bryson DeChambeau at 6-under) and just rolled his eyes at the entire thing. “I don’t know what to say,” he continued. “I’m too big and I’m too small. Listen, I’m going to make me happy. I don’t care what anybody else says. I’m doing it for me …"
He paused and looked at a video monitor hanging on the wall that showed him leading another major. Nothing like being able to call “scoreboard” and put to rest one of the more ridiculous controversies/stories/situations of the year. Maybe Koepka did lose weight so he’d look better in a photo spread. Maybe he struggles with his frame because he doesn’t have the traditional long and lean golf body. Or maybe he just tries different things because he can. He admitted that “the diet that I was on was probably not the best. I was, like, 1,800 calories a day. I mean, you’re not going to be in the best physical shape at that point” but that is obviously correctable. If what Koepka showed on Thursday is the definition of a self-sabotaged golf game than he might want to keep it up. A guy who supposedly couldn’t drive anymore hit 12 of 14 fairways and 15 of 18 greens in regulation. He carded six birdies and 12 pars. He averaged 1.6 putts a hole. With a little luck, or a little better putting, he could be 8-under or even better. He was tremendous, jumping out on an excellent leaderboard and crushing anyone’s hopes that he’d dieted his way out of contention. This is still Brooks Koepka at a major championship – where three of his five career victories have occurred. There’s three rounds to go here, a lot of golf, a lot of contenders. “There’s 72 holes,” he noted. But he also said he’s learned to let bad shots drift out of his mind as he seeks an emotional plateau that leads itself to brilliant play. “I don't want to say you kind of blackout, but you just kind of, you're not really thinking about anything,” Koepka said. “You make it kind of a reaction sport. That's kind of how – you see the ball, you kind of see your shot, and then whatever you see and just pull the trigger and go. If nothing else, the too-thin-due-to-a-photo-shoot nonsense is over. Koepka has a chef at his house in Augusta and he appears to be eating just fine.